West Bromwich Albion sacked manager Darren Moore and assistant Graeme Jones, who had been strongly linked to the Luton vacancy, after the club's 1-1 draw at Ipswich Town on Saturday. 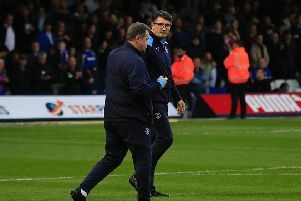 Despite being fourth in the Championship, Moore was dismissed along with his number two Jones, and part time assistant coach Wayne Jacobs. Jones, who had been assistant to Roberto Martinez at Swansea City, Wigan Athletic, Everton and also Belgium, before moving to the Hawthorns last summer, had been a hot favourite with bookmakers for the manager's position when ex-Luton boss Nathan Jones departed for Stoke City in January. Club legend and chief recruitment officer Mick Harford took over on an interim basis though, eventually being appointed until the end of the season after continuing Town's stunning unbeaten run and leading them to the top of the table. With Harford indicating he doesn't want the job on a permanent basis next term, reports have surfaced in the national media that Luton had agreed a compensation package with the Baggies for Jones to take over at Kenilworth Road in the summer, although that has yet to be confirmed by anyone within the Hatters' hierarchy.